This is a cross-section of a Douglas-fir (Pseudotsuga menziesii) from the Catalina Mountains north of Tucson, Arizona. The sample shows excellent ring-width variability from one ring to the next. The inner ring on this sample has been dated to 1928, and the outer ring dated to 1965. Douglas-fir is one of the preferred species for dendrochronology in the western portions of North America. The species has exceptional circuit uniformity, meaning that the rings are usually concentric around the middle. The rings are also well defined - in other words, there is a sharp definition between the earlywood (wood formed early in the growing season) and latewood (wood formed later in the growing season). In addition, Douglas-fir is well distributed from Canada all the way down to northern Mexico, making this an ideal species for large-scale climate reconstructions. The cross-section above is a white fir (Abies concolor) from California cut in 1981. Note the very narrow ring in 1977 reflecting a dry year. The cross-section below is a Douglas-fir from the Jemez Mountains in northern New Mexico, showing darker bands of reaction wood(toward the top right corner). Reaction wood forms when a tree tilts. There are many elements that may cause a tree to tilt, like wind and snow. The sample also shows a branch growing from the center of the tree outward (dark spot toward the bottom right corner). Comparing the two samples, which are about the same size around, we see that growth conditions were more favorable for the white fir than for the Douglas-fir, because of the wider rings. The Douglas-fir was growing in a closed canopy (a forest overshadowed by bigger trees), while the white fir was growing in a relatively open area exposed to more sun and water. This image shows a closeup of ponderosa pine (Pinus ponderosa) tree rings. Growth is from the left to right. Earlywood is marked by lighter colored cells, while latewood is marked by the dark bands. Together, they make up one annual tree ring. Note the subtle false rings in the fourth ring from the left and in the fifth ring from the right. These two examples are not so obvious, but sometimes in certain tree species growing in certain environments, false rings can look just like true rings. Without training in crossdating, false rings can be problematic when attempting to crossdate tree ring patterns. False rings can usually be identified during the crossdating process. Sometimes, they can actually aid in the crossdating process if the false rings occur in numerous trees sampled from a site. This is a cross-section of post oak (Quercus stellata) showing its tree rings. Growth is from left to right. Note the difference in growth patterns between the four younger rings to the left and the older rings to the right. During the year in which the fourth ring from the left formed, some disturbance occurred which greatly reduced the growth rate of this tree. Perhaps a wind storm damaged the crown of the tree, thus reducing its ability to photosynthesize and produce more wood. Oak is a highly preferred species to use in dendrochronology - in fact, the longest continuous tree-ring chronology anywhere in the world was developed in Europe and is currently about 10,000 year in length. This chronology is providing scientists new insights on climate over the past 10,000 years, especially at the end of the last Glacial Maximum. This is a microphotograph of two red oak (Quercus rubra) tree rings. Growth is from the left to the right. The large vessels in the earlywood indicate this is a ring-porous angiosperm tree species. The large earlywood vessels are formed early in the spring during the initial flush of growth that occurs when the tree breaks dormancy after the winter. The vessels help transport water and nutrients up to the crown of the tree. Because ring-porous species almost always begin annual growth with this initial flush, missing rings are rare in such species as oak and elm. In fact, the only recorded instance of a missing ring in oak trees occurred in the year 1816, also known as the Year Without a Summer. A volcanic eruption in the year 1815 caused much cooler temperatures globally, thus causing oak trees to remain dormant. Therefore, no clear annual ring was formed in 1816 for certain locations in Europe. This is another closeup of post oak with a ray cutting across the tree rings, offsetting the rings between the ray. The earlywood is marked by large vessels used in conducting water. Latewood appears darker, marked by smaller vessels. Occasionally, offsets in oak tree rings can be problematic when trying to crossdate the rings. Dendrochronologists therefore must be careful when working with oak species, as these rays can cause a misdate of one year. A closeup of tree rings from a sugar maple (Acer saccharum). Growth is from the left to the right. The small vessels throughout the entire tree ring indicates this is a diffuse-porous angiosperm species. In general, diffuse-porous trees are difficult to crossdate because the rings are not so well defined as they are with conifer and ring-porous species. The maples and birches (Betula spp.) are examples of diffuse-porous species that can be easily dated, however. The aspens and other poplars (Populus spp.) are more difficult to work with. 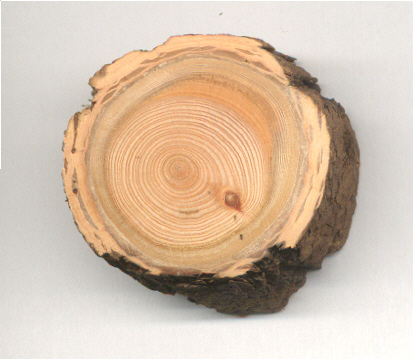 With careful sample collection and preparation techniques, tree-ring dating can be applied to practically all diffuse-porous species. A ll graphics and text on these pages © 1996 by Lori Martinez, Laboratory of Tree-Ring Research, and The University of Arizona. Last updated October, 2001. All rights reserved.